Instead of x-ray film, digital radiography uses a digital image capture device. This gives advantages of immediate image preview and availability; elimination of costly film processing steps; a wider dynamic range, which makes it more forgiving for over- and under-exposure; as well as the ability to apply special image processing techniques that enhance overall display quality of the image. 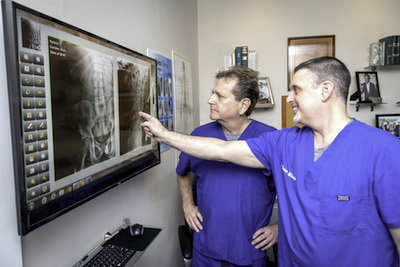 After introducing the first DRX9000 non-surgical disc decompression FDA cleared machine, Fraum Chiropractic Life Center has now added the first DICOM Digital X-Ray System for chiropractors in the Lowcountry. DICOM (or Digital Imaging and Communications in Medicine) is a standard developed by the American College of Radiology and the National Electrical Manufacturers Association. Our patients are the best and we want them to have the best. TRU Digital Imaging Solutions is the leading technology for chiropractic professionals today. Your x-rays are instantaneously transferred to our in-office computer network. The advent of digital radiography is comparable to the rise of digital cameras over traditional film cameras in the consumer industry, and the comparative benefits are actually quite similar. One of the great benefits of the digital x-ray system is the convenience that it provides when compared to analog radiography. For example, your chiropractor will no longer need a darkroom and the associated storage space when using a digital system. Once the software has captured the digital image, it is immediately available for adjustments by Team Fraum. The digital system captures and processes high-resolution images consisting of millions of pixels in a matter of seconds. Interested in learning more? Reach out to us to get started!